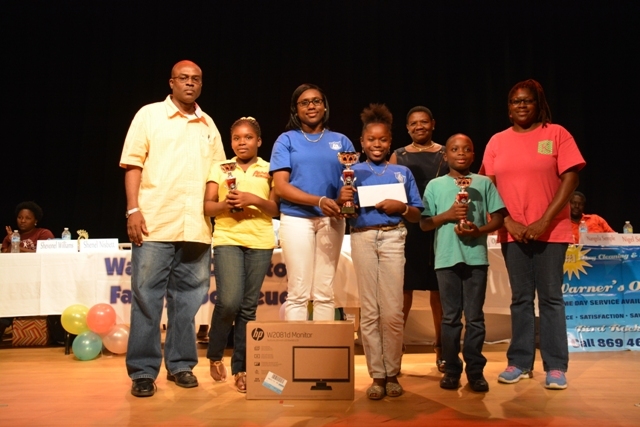 NIA CHARLESTOWN NEVIS (JULY 15, 2015)— The Charlestown Secondary School (CSS) team of Shevonel Williams and her mother Shenel Nisbett, emerged winners of the 6th annual joint School Libraries and Department of Education’s Warner’s One Stop Family Book Feud on July 11, 2015. It was held at the Nevis Performing Arts Center. The Montessori Academy’s team Lincoln Sandiford and his mother Casandra placed second and Elizabeth Pemberton Primary School’s D’Rhys Stanley and her father Denzil placed third. The Warner One Stop Family Book Feud has been designed to encourage and strengthen family ties, cultivate a reading environment at home, develop a love and appreciation for reading and books and to raise funds for the library. The competition is between families of primary and secondary school students. A number of seven schools participated. The other participants in the contest were Khylee Clarke and Taresia Browne for Ivor Walters Primary, Risa and Tyasia Mckoy for Maude Cross Preparatory, Ophelia and Jaeden Morton for St. Thomas’ Primary, Marie and Hujay Jeffers for Violet O. J. Nicholls Primary, Yolanda and Leniqua Dyer for Joycelyn Liburd Primary and Nigel and Nangela Semple for St. James Primary schools. 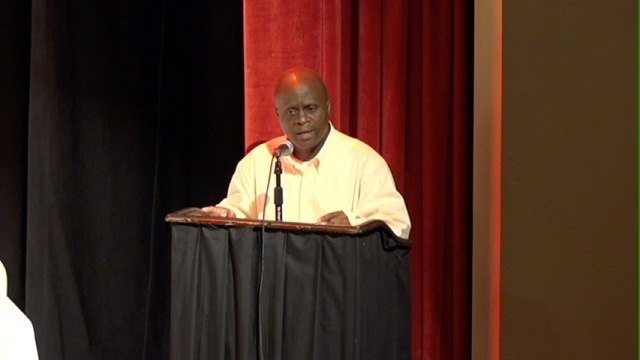 The general segment consisted of five categories: Nevisian History, Poetry, Science, Local Sayings/Proverbs and Fiction in two rounds. In one round the student answered and in the second the parent answered. Permanent Secretary in the Premier’s Ministry Wakely Daniel declared the official start of the contest. In remarks he described the event as educational, fun and family oriented. Daniel praised the organizers for their hard work, commitment and dedication, which has transformed the event into a staple on the island’s educational calendar. He said the annual contest highlighted reading which was fundamental to all aspects of life.